In this article we’ll cover the producing of game soundtracks and how to guide composers so their tracks fit your game and communicate important aspects. 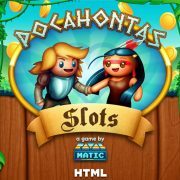 In this occasion, Daniel Ara, helped us to create the OST of Pocahontas Slots, a light casual approach to slot machines with an indian flavour. 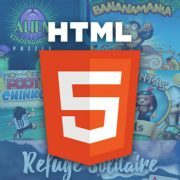 At this early stage you should focus on general aspects like music genre (something that fits your theme), tempo (that matches with the game pace), and duration of the track (in this case we are working on an HTML5 game, so we had to keep the main track below a minute in order to keep short preloading times). Here’s what Daniel came up with as one of the firsts drafts. One of the other two was eventually used as a secondary track for Bonus Rounds. The other draft had a too dark, ominous spirit, so it didn’t match the game tone. One of the cool things we found here was the ambient landscape using nature sounds. This is something to always keep in consideration. These kind of ambience sounds will reinforce the projection of the world in your game. Although the composition was a cool draft, it needed a second iteration with a more casual and lighter ambience. By the use of piccolo (tiny flute) in addition to indian flute, we not only gave the composition a happier feeeling, but also joined the two colliding cultures of the game: the american indians and the european settlers. Besides that, the low rank frequency of the indian drums that created a constant noise was also reduced. So we definitely had the indian atmosphere, but still there was a music layer missing. The art, the ambience, the game itself, is a pop revision of the story of Pocahontas, so the music should also remind the casual approach to the theme by using a videogamey accompanying melody. An artificial sound opposing the organic instruments performing in the tune that also gave an even happier feeling. And finally this is the final version of Pocahontas Slots soundtrack. A positive track that resounds like both indian and the settlers musical compositions (broad commonplaces), with a dynamic tempo, a semi-hypnotic pace, and a videogame touch which reminds that there’s no intention to deliver a pretentious or historically accurate composition. I hope you enjoy Daniel Ara‘s work and appreciate the process which leads to a soundtrack that matches your game needs.